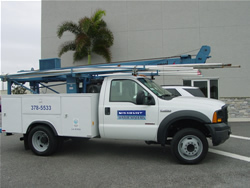 Service Area: Tampa, St. Pete, Sarasota, Myakka, Bradenton, Ellenton, Palmetto, Ruskin, Osprey, Venice, Nokomis, Sun City, Englewood, Parrish, Ona, Arcadia, North Port, Port Charlotte, Punta Gorda, Fort Myers, Naples, Cape Coral. Since 1993, a family owned, local business. We’re here for you yesterday, today and tomorrow.